There are few men with as deep and true a love for fish as me. Especially something odd, different, or drop-dead gorgeous. But, there are some things we just shouldn't keep in captivity. The reasons are many, ranging from our inability to keep it alive, or to provide a reasonable environment for it, to it being rare or endangered. There are so many things available to keep already that are as beautiful or interesting as anything one could want. Why do we always have to say "more, rarer, bigger, bester," or whatever?? The hobbyist should be the first one to just say no. We should have to fortitude and discipline to know what not to keep. Few of us would consider keeping a highly poisonous Black Mamba snake, for obvious reasons. Yet, many want sharks they have NO WAY of offering a reasonable life to. Like most things in life, when we can't police ourselves, others step in to do so. In the fish hobby, we need to be even more careful because of certain misguided groups who don't think ANY saltwater fish should be kept (yet many are cultured for food around the world). The fact is that of the hundreds of species of freshwater fish available that are all captive-raised, if no wild ones were caught in the first place, these hundreds of species of aquacultured fish would not be available. 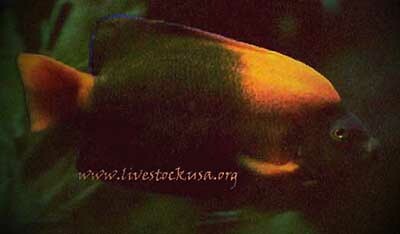 In the last two decades, we have seen a couple dozen species of saltwater fish become avaiable that are captive bred. Now even corals are being aquacultured. Had any and all collecting been outlawed, this would not be the case. That would be sad, and not to the benefit of humankind. It is our responsibility to research animals before we attempt to keep them. To know something about them, where they live, how they live, what they eat and need. We owe the animals this. Yet still many want, for instance, Leopard Sharks because they are beautiful. The animal is a temperate (not tropical) shark, living in 55-65 degree water, grows to a length of eight feet. Who of those who bought one in the last 20 years had a swimming pool to put it in? Yet the demand exists. The demand is so great, divers were catching pregnant females, and splitting their bellies open to pull out 100 "aquarium sized" babies. The female left to die, never to breed again to continue her species. I doubt many of the thousands acquired in this manner and sold to hobbyists are still alive today. I doubt many of them led a decent life. It is not cool to support such activities, and wanting a Leopard Shark means someone will probably go out and kill a pregnant female. Have we no morals? Clarion Angel is a beautiful rare Angelfish, found almost exclusively around Clarion Island in the eastern Pacific, SW of Baja California. It is listed as endangered because the one island is the only gene pool of the species. Occasional wanderers elsewhere are presumed to have originated at Clarion Island. One man-made disaster could wipe them out. In the summer-fall of 2004, a shipment of about a hundred Clarion Angels made it to Los Angeles, CA. They were collected illegally at the island, brought to Baja, and shipped up here as Passer Angels. Several of the biggest wholesale saltwater suppliers in L.A. had them. These business owners knew these fish were illegal, endangered species. (Most had never seen one in a decade, if ever.) Some invoiced them as Passers (as though they came in on false documents) and took the profit, smiled, and thought this was okay. Some got caught with them when Fish & Wildlife inspectors spotted them in a facility. I heard that the wholesalers paid a thousand dollars ($1,000) for each fish and that they were being sold for two to three thousand. This means that they were being sold retail for as much as anyone could get for them. There are certainly some stores out there who got some of these illegal, endangered fish, maybe you even saw one! If I saw one in my local shop, I would call my local Fish & Wildlife Dept., since the store owners knowingly promote the capture, collection, and trade of endangered species. In all likelihood, a store you buy fish from probably buys from one of these unscrupulous, wholesalers that would gladly deal in endangered species for a buck. But, they would have only done this if the demand or market existed. If they knew hobbyists policed themselves and just said no to endangered species, instead of trying to "out-cool" and "out-rare" each other, it would not have happened. Now, I guess in the long haul the Clarion Angels will repopulate themselves, but many of those that made it to L.A. were sick, diseased, etc., from being overcrowded on the way and did not make it. If I were King, these importers would have their import licenses revoked for 10 years. There is no excuse. There should be no tolerence. I can't name names, because some who had and sold them would sue me! In my opinion, there is nothing worse for the hobby than this type of abuse. First the Feds (U.S. Fish & Wildlife) who inspect and clear shipments and are responsible for protecting endangered species are really upset. Now they check all shipments more thoroughly, costing hundreds of hours waiting for shipments to be cleared. These costs to the wholesale supplier are passed on to you on your legal fish you want. Then, unfortunately, some misguided "extremist wackos" (who really don't often have a clue as to which animals should have what rights) use instances like this to argue that the industry cannot and will not police itself, a dollar being more important than ethics, and we can hardly argue them for that when things like this happen! Remember, there are those who believe there should be no collection of anything, (usually those who drive 75mph in their gas guzzler smashing butterflies - but that's OK) and would prefer to shut us down! There are also many, many animals, some in the trade that ARE legal, common animals, but we have realistically no understanding of their requirements for prolonged captivity, and therefore, we should not keep them. The Psychedelic Mandarin Fish are a good example. Who would not want one? But, who has one that is three years old? Most of the folks buying them don't have amphipod-infested reef tanks that they will do well in. I know they've been spawned in a 10 gallon tank, but this is not the fate of most of them. Everyone says they want a Leafy Sea Dragon, but how many would really set up a proper tank for them? Ribbon Eels are another example. Now it's not that none of these can be properly kept, it's that 90% are NOT kept properly. Most people don't provide anemones with all they need. There is a long list of stuff we should really think hard about keeping, or even wanting. For some of it, we are better off just saying NO, leave it in the sea, and go see it in the wild one day. Whilst an Orca (Killer Whale) is impressive at Sea World, wait till you see them in the wild! The same with parrots; a flock of wild parrots screaming in the jungle is something you would never forget. The public zoos and aquariums provide opportunities to see these things in proper environment. This is better, that people who otherwise would never get to see them in the wild have the opportunity, and so become aware of the things out there in the world, and therefore the environment. But ask yourself if YOU can keep it right and do the animal justice. So, don't worry so much about being cool, and having the rarest of the rarest. I am always more impressed by someone who has a common fish, KEPT WELL, HAPPY, BREEDING, than a rarity poorly kept. Take the time to learn about your animals. Provide a good healthy environment for them. Don't support (by asking for) collecting of things we can't really keep right anyway. Sometimes it is best to leave it in the sea.